Geordi is in a shuttle going to a conference on Riza, and Picard sent him a few days early for some holiday time. En route he's intercepted by a Romulan ship and abducted. They remove his visor and torture him with horrible images beamed directly into his brain using the neural implants that make his visor work. Meanwhile some guy who looks like Geordi is sent to the conference with Geordi's visor. Then the brainwashing begins. The Romulans take Geordi to a simulation of 10 Forward and order him to kill Chief O'Brien. How they know what 10 Forward or O'Brien looks like I don't know. Geordi kills the simulated O'Brien with a phaser, then sits down for a drink, but he hesitated so the brainwashing continues. Meanwhile a Klingon ambassador comes to the Enterprise and asks Picard to come to a Klingon planet near the Federation border which has a separatist rebel problem. There are accusations that the Federation has been arming the rebels and Picard is determined to prove it isn't so. Geordi returns, talks about his great trip to Riza and spills drink over O'Brien in 10 Forward. 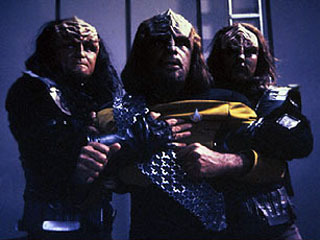 The Klingon governor is suspicious of the Enterprise being there and shows the Federation weapons used by the rebels. Geordi and Data test them and find that though they are Federation design they have been charged by Romulan chargers (or something). The Romulans would benefit from the alliance between the Klingons and the Federation breaking. Data detects weird readings on the ship. Geordi sneaks around a cargo bay and secretly beams weapons down to the planet, but of course they're intercepted and the Governor is even more convinced that the Federation is arming the rebels. Picard orders a full investigation and it is narrowed down to the cargo bay transporter, but Geordi has no memory of what he did. The Ambassador tells Picard that he should invite the Governor to see their investigation. Geordi goes to the Ambassador's quarters and the Ambassador instructs him to kill the Governor in the cargo bay in front of everyone and say he's doing it for the rebels. Later Geordi can't sleep and calls O'Brien, but doesn't know why. He goes to see Crusher about insomnia, and she suggests he seems fine but should get his visor checked next time they're at a star base. Data and Riker look into the weird readings, pretty sure they're some kind of communication to the Romulans. Data does computer work and the Computer identifies that the readings are like human brainwaves, and there aren't many devices on board that interact with those. The Governor comes on board to see the investigation, he's still very skeptical. Geordi walks down corridors in a suspenseful fashion. Data investigates the shuttle and after more computer work he discovers that it has been tampered with and had been in a Romulan tractor beam. Data calls Geordi, who doesn't respond. Data checks where Geordi is and then orders Worf to apprehend him immediately. Worf is stopped from approaching by the Governor's Klingon guards, but he calls out as Geordi approaches and Picard stops his Chief Engineer from firing at the Governor. Picard doesn't know how to explain this, but then Data arrives and does. Turns out the only people who were near Geordi at the time of the weird readings were Picard and the Ambassador, one of them should have a transmitter device on them. The Ambassador refuses to be searched, but when the Governor says he'll search him and the Ambassador suddenly requests asylum from Picard, who says he'll grant it if he's exonerated of the crime. 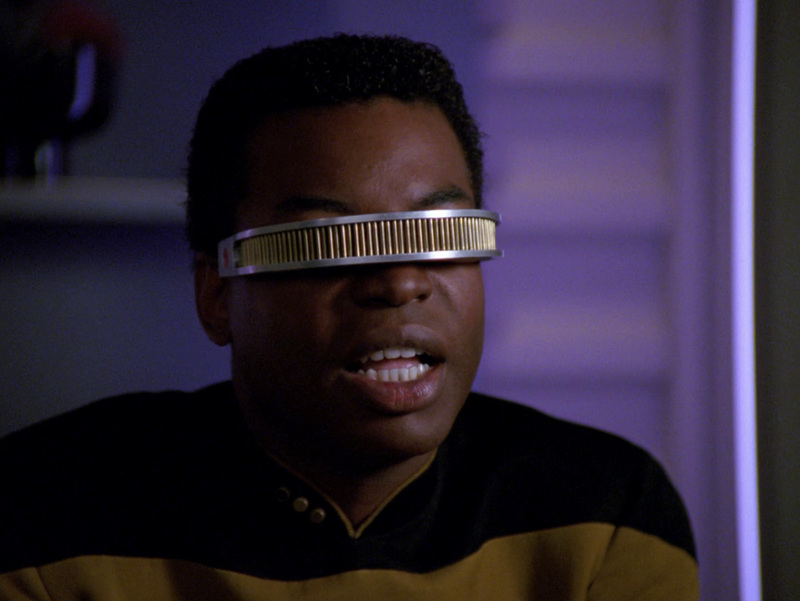 Geordi is very distressed to learn that he has false memories. Picard is met by the Ambassador who trusts him and thinks he'll be a good person to investigate what's going on. 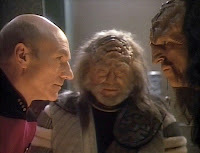 Picard seems to have been involved in various important Klingon things of late and so I guess he's got a good reputation, especially with those who like the current Klingon leadership (Picard was involved in choosing). The Governor is very suspicious that the Federation must be involved with the separatists and so he's distrustful of Picard. Picard is very insistent that the Federation do not get involved in the internal politics of their allies, though this is not an episode that requires Picard's eloquence very much. Remember when he used to solve most things with a speech at the end of episode. Data mostly asks the Computer questions during his investigation, just as any human would. Plus it seems like the Computer immediately has the answers, it just won't tell you anything until you ask the right question. You can tell this was made in the early 90s; processing power, search terms and the time things take -plus Data's lack of connectivity- all seem kinda old-fashioned now. It'll take 3 hours for a random computer search to check 327 types of systems. I know it's more complicated than a google search but that seems kind of slow to me. Surely Data would be all the more effective if he could interface with the Computer directly, rather than delivering voice commands, though I suppose that would make bad TV. I gotta feel bad for Geordi. Abduction, torture and brain washing. Poor guy! We don't know what images the Romulans are putting in his brain, but it's clear they're dreadful. He remembers the Riza trip, but has odd reactions to O'Brien. We get to see through Geordi's visor, the view is greenish and there are weird symbols and noises, which I think are supposed to be the Romulan signals. Geordi tries to investigate because it's his job, but while he's brainwashed he also knows how to cover his tracks. He's kind of at war with himself, without knowing it. After waking up and calling O'Brien for no reason Geordi starts to realise something is wrong and goes to Crusher, but the Romulans did their job well. There's something that looks a little different, but it only seems like a small thing and not something that will have a real impact on Geordi's health. I wonder how the Romulans got so much info about how Geordi's visor works? Also who was that guy they sent to the conference to take Geordi's place? I don' feel like there was enough about him and what actually happened on Riza. 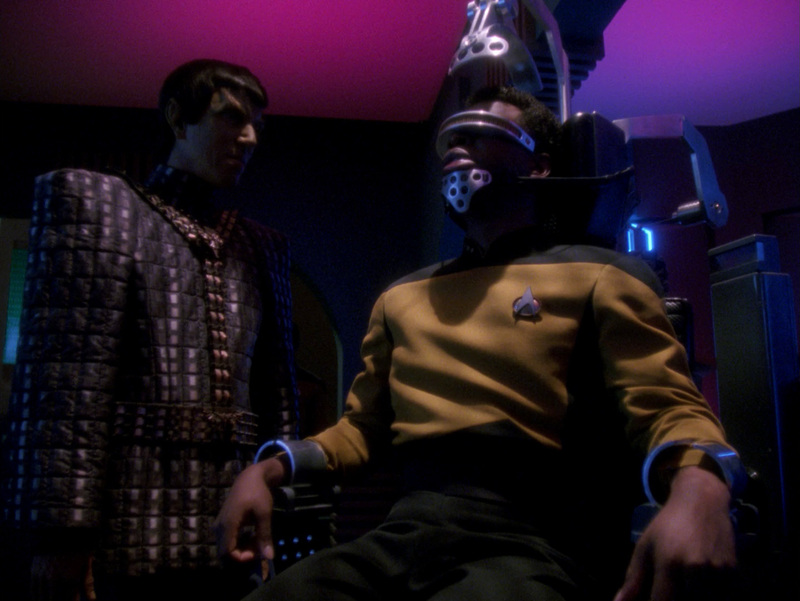 Did they use the visor recording to implant the false memories in Geordi? Suspenseful camera angles are used as Geordi approaches the cargo bay, it's pretty effective. Even if I kept thinking about Will Ferrell's character from Zoolander, which made things a bit more amusing than they were supposed to be. At the end Geordi's talk with Troi is so, so sad. He can't trust his memories, his mind has been violated and even though he is not my favourite character I feel so sad for him because it's horrible. 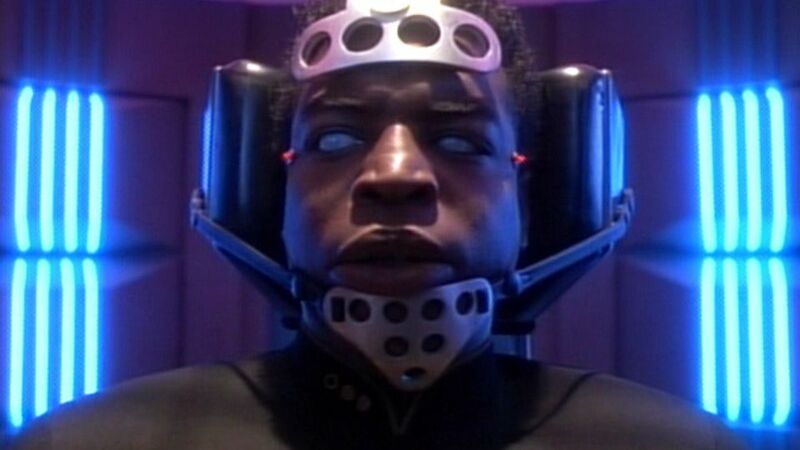 This moment is played with such strong emotion by LeVar Burton. At first the Amabassador asks Picard if he can work with anyone other than Worf as his discommendation means all Klingons need to treat him as a pariah, and it makes things really awkward. 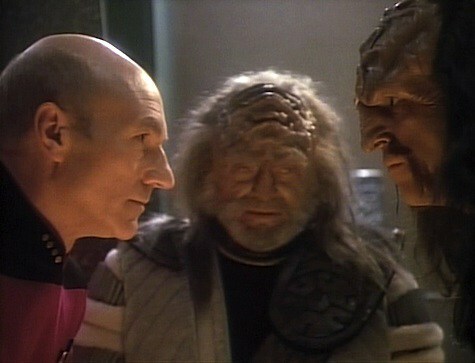 Picard insists that Worf is his Chief Security Officer and he won't send anyone else in his place. 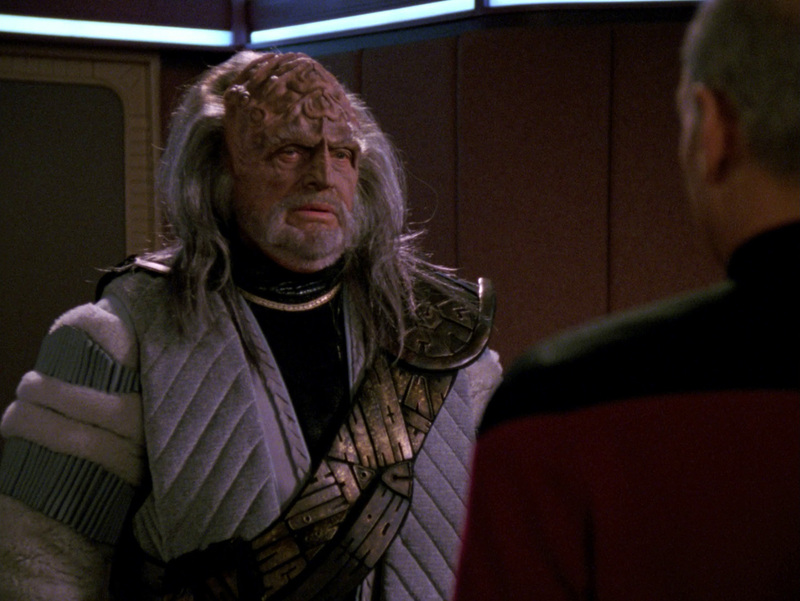 Worf defends Picard's word and makes reference to his own perceived lack of honour, no surprise that he;s defensive about it. 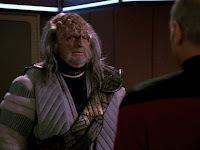 Surprisingly the Ambassador tells Worf that his killing of Duras means that some of the Klingon High Council would thank him, and that it was a truly Klingon thing to do. It's the first approval Worf's had from another Klingon for a while. I wonder how much the Ambassador knows about the truth behind Worf's status? I mean now that the leadership has changed can't the truth come out? I guess there's still enough people around who don't want it to, and maybe that it happened at all is bad enough. When Data can't get to Geordi in time he calls Worf, since he is Chief of Security and conveniently near by. Worf is shocked that Data tells him to apprehend Geordi, but as soon as it's an order he does as he's told. Worf is stopped from getting to Geordi by the Governor's guards, perhaps they think he's going for Governor, though why Worf couldn't go around the group I don't know. Worf has to call out to get everyone to look at Geordi, which means Picard is the one who actually stops and disarms Geordi just in time. I think is a shame for Worf because surely he should get to do this sort of thing. Geordi is shocked and angry and disbelieving. He remembers Riza, he tells Troi about it and though she is being compassionate and understanding she does have a kind of conversationally trick him into remembering what really happened and tells him to put his memories to one side. Geordi's distress and lack of certainty are horrible, but Troi assures him that it's a good sign, and she'll be there to help him get his memories back. 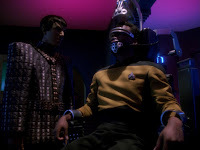 I hope this process is shown on screen, or at east alluded to, not sure if it will be but after the trauma he;s been through geordi will need a lot of help. 2. Geordi and Data report to Picard and the Ambassador about the transporter investigation and the tampered chips they've found. Only person on board with the relevant skills and no alibi is Geordi, suspicion doesn't fall on him and he's determined to find out what happened. Data mentions the weird readings he and Riker have been investigating. After they leave the Ambassador tells Picard he should invite the Governor to see their investigation as a sign of good faith. Geordi and Troi discuss what happened (see It's Not Easy Being Troi) and the process he'll need to go through. It's so sad because he'll have to put aside pleasant memories and relive his abuse. It's a powerful scene.